27-11-94. Six numbers that carry huge meaning for me, and for many fans of a small town, lower league Scottish football team that most people have never heard of. Once, a couple of years after this famous date, when my high school English class was tasked with writing about ‘the best day of your life’, I didn’t have to think too hard. Over the intervening 20 years there have been personal landmarks and achievements, and many a few great footballing occasions (the UEFA Cup run of the following year, James McFadden’s Scotland screamer in Paris, the recent Ramsdens Cup final win over Rangers), but that night in late November still ranks as the best of them all. Like most 11-year-old boys, I was football daft. Almost every night after school we’d go to the park to play for hours on end (yes, with jumpers for goalposts), and since the 91/92 season my Dad had been taking me to Starks Park regularly. We’d already seen them romp to the First Division title in 1992, as our gruffly charismatic Northern Irish manager Jimmy Nicholl started to exert his magisterial influence on the team. The timing of it all still strikes me as unbelievably prescient. We went to Glasgow that sunny day with a lot of trepidation and a little hope. This ratio wasn’t helped when the driver of our supporters’ bus tried to drop us off at the wrong end of Ibrox, amidst a sea of green and white. A few choice words from the back of the bus changed his mind, luckily. I remember feeling overawed by the size of the Celtic support – that lump in the throat most fans of small Scottish teams feel when confronted by either half of the Old Firm. It was then that the sense of David vs Goliath really sunk in. We were most definitely, as our local rivals in Dunfermline like to call us, the ‘wee team’. Of course, none of this mattered on the pitch, where a team of lively youths and wily old foxes (special mention to the unshakeable Dave Narey) never gave up the fight, even when Celtic were 10 minutes away from a much-needed silverware party. The two iconic images of Gordon Dalziel ‘nosing’ the ball over the goal line from a few yards, and of Scott Thomson guessing right to deny, unthinkably, Celtic captain Paul McStay’s penalty, have become immortalised in Scottish football folklore. 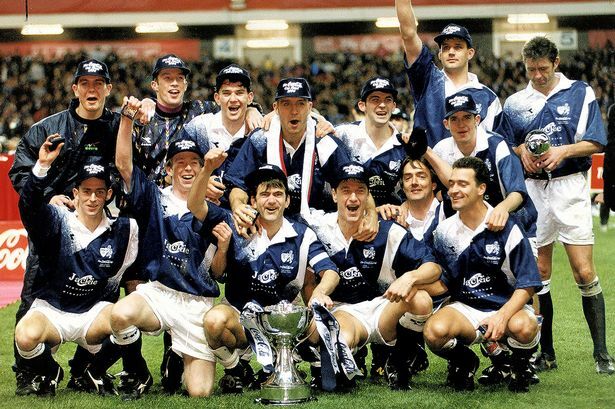 But for Raith fans like me they’re more than that – they’re part of our personal history, the high watermark in decades of dogged support that will likely never be topped, a defining moment for our club, and a memory that will always raise a smile. To say ‘I was there’ is like a badge of honour among fans of a certain age. The euphoria of that moment (summed up by striker Ally Graham’s TV interview in the immediate aftermath, when he can hardly find any words other than ‘unbelievable’) may have dissipated, but it’s the memory of that night that keeps us going, through all those away games in Alloa and Cowdenbeath, those last minute defeats, those end-of-season slumps and what-might-have-beens. After the match, we got back on the bus to Kirkcaldy and, amazingly, there was hardly any triumphant chanting, teary man-hugs or whooping and hollering. Most of us were just sat there scunnered by what had just happened, and it took the drive back to Fife to bring us back to our senses. Me, my Dad and sister (who had been roped in for the once-in-a-lifetime occasion) got off at the bus station and wandered in search of the inevitable street party. On the High Street, a photographer from The Courier saw my Raith flag and stopped us. Along with another group of fans, our picture was in print the next day, under the headline, ‘Dancing in the Streets of Raith’. It was this kind of stranger-than-fiction fate that sums up 27/11/94 for me, two decades later. It was ridiculous, fairytale stuff, the like of which just doesn’t happen in reality. Or does it? Posted in Football. Tagged Celtic, football, Raith Rovers, scotland.